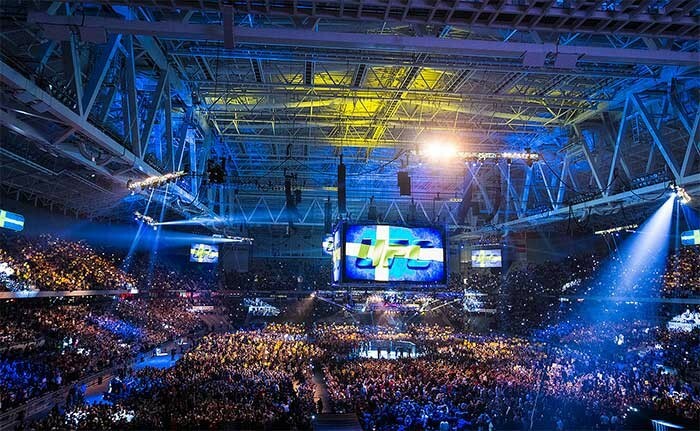 Sweden – The UFC hit Stockholm's Tele2 Arena for the one of the promotion's most highly attended shows ever, with LD Jason Eible weighing in with Avolites' heavyweight Sapphire Touch console and Wing for the show. "This was UFC's second stadium show, with over 30,000 fans in attendance, so it was important for us to show the size of the crowd inside this huge stadium," says Eible, of Frank Gatto & Associates, where for 20 years he has designed television and special event lighting for networks including HBO, ABC, ESPN, Showtime, Fox Sports, NBC Sports and PPV. The UFC show represents the high end of production requirements, and the show was broadcast on FOX in the US. "We had 126 moving heads, about 200 LED pars, 70 atomic strobes and miles of truss," notes Eible. "We also had about 400 conventional fixtures. Given the size of the show, the Sapphire Touch was a no-brainer." Jason's Sapphire Touch and Wing, supplied by HSL via Starlight, along with a second as backup, proved more than up to the challenge for the event, which saw Anthony Johnson defeat Alexander Gustafsson by TKO in the first round of the headline bout. "The playback window is among one of my favourite features of Titan Software, it proved to be a great tool on this show," notes Eible, who also singled out Multi User Backup as a great feature. Jonathan Dawson-Butterworth of Lighting Productions Ltd. was on hand to set Multi User up and he also networked the consoles together, before Jason and his elected second LD Jim Matthews set about programming on their separate surfaces. Eible states: "It was nice having the extra surface for the two of us to program simultaneously, and then on the day switch the second console to act as back up. "The set-up was straightforward, with all the support we had from Jonathan Dawson and Avolites – getting set up and programming using Multi User was seamless. We also had great support from Starlight who got the lighting system up and running quickly." Jason has enjoyed his experiences with the Sapphire enough to purchase his own, having placed an order recently to complement a range including Titan Mobile. "Something that catches my attention is that people are constantly looking over my shoulder saying, 'I didn't know Avo could do that!' about things like the motorised faders and touch surface. The one thing that gets everyone is being able to set your own picture legends using Quicksketch. A lot of users, they really like that feature."